The FLS980 has now been discontinued and is superseded by our new and improved FLS1000 photoluminescence spectrometer. The FLS1000 is a state of the art spectrometer for the most demanding fluorescence analysis applications in Photophysics, Photochemistry, Materials Sciences and Life Sciences. 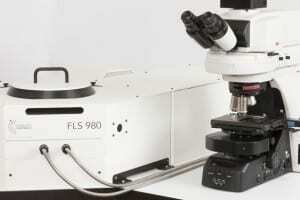 Discover the FLS1000 photoluminescence spectrometer. We offer a full range of spectrometer upgrades for the FLS980 including configuration, light source and software upgrades in addition to monochromator options, detector option and fluorescence and phosphorescence upgrades. View the full range of FLS980 upgrades. For further information regarding the FLS980, please contact a member of our sales team who will be delighted to help. The FLS980 combines ultimate sensitivity with high spectral resolution and excellent stray light rejection, setting the industry the standard for both steady state and time-resolved photoluminescence spectroscopy in the ultraviolet and near-infrared spectral range. The modular construction enables the system to be readily configured to meet your individual research needs as well as be reconfigured as your research changes. The FLS980 is supplied with computer-controlled, triple grating turret monochromators, with up to three different gratings permanently fitted. This allows a large spectral range to be covered while providing the maximum ease of use. Two detectors with independent exit slits can be mounted on a single emission monochromator (three on double emission monochromator). Single photon counting PMTs are available to cover the wavelength range from 200 nm – 1700 nm, while analog detectors extend the wavelength range to beyond 5000 nm. 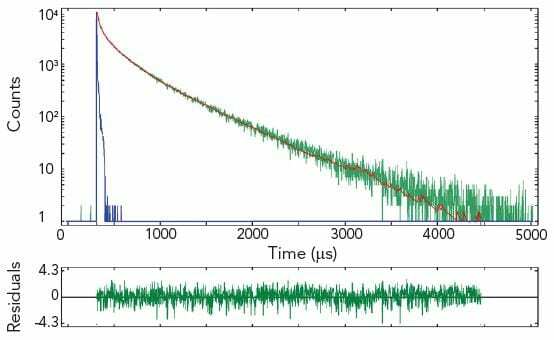 A signal-to-noise ratio of >25,000:1 for the Water Raman Spectrum under standard measurement conditions is guaranteed. This sensitivity allows the spectra of weak dye solutions (< 100 fM) to be routinely measured. An optional upgrade to the sensitivty of the FLS980 is available. This takes the signal-to-noise ratio to >35,000:1 guaranteed. The FLS980 has a USB interface and all modes of operation are controlled by ONE data acquisition module and ONE all-inclusive F980 software package for data acquisition and analysis. Light source, detector, grating, slits, polarizers are all computer-controlled for accurate and precise measurements. The FLS980 comes standard with a 450 W ozone free xenon arc lamp that covers a range of 230 nm to 1000 nm for steady state measurements. A variety of other sources can be integrated including microsecond flashlamps, nanosecond flashlamp, pulsed diode lasers (EPL Series), pulsed light emitting diodes (EPLED Series), supercontinuum lasers, Ti:sapphire lasers, Q-switched solid state lasers and OPOs, dye lasers, and infrared CW and pulsed lasers for upconversion measurements. Single and double grating Czerny-Turner monochromators are available in the FLS980 with 300 mm (or 2 x 300 mm) focal length, high optical throughput, excellent stray light rejection and low temporal dispersion. The monochromators feature triple grating turrets with up to three gratings on each turret and computer-controlled slits. A full range of detector options are available to enhance the range of spectral coverage and or to reduce the instrumental response width for lifetime measurements. The instrument comes standard with a R928P PMT detector in a cooled housing which covers a range from 200 nm – 870 nm, in TCSPC mode the instrumental response width is approximately 600 ps. Optional detectors include: high speed PMTs in a cooled housing with instrument response <100 ps, MCP-PMT in cooled housings with a response <25 ps, NIR-PMTs to cover spectral ranges out to 1700 nm with photon counting sensitivity and speed, InGaAs detectors with spectral coverage up to ~1.65 μm, 2.05 um and 2.55 μm, InAs and InSb detectors to cover out to 5.5 μm. At the heart of the FLS980 is an exceptionally large sample chamber that allows access to the sample from all sides, top and bottom. 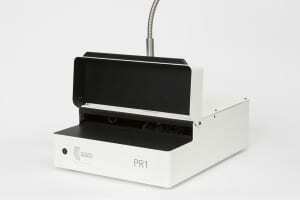 This ensures compatibility and simplifies access to a variety of sample holders. A wide variety of photomultipliers and analogue detectors are available. Please visit the FLS980 Upgrades page for more information or contact us directly. 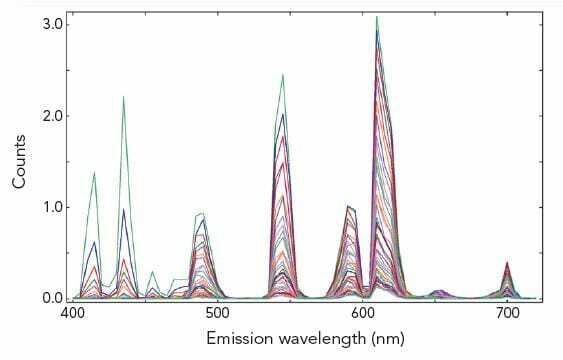 Excitation and emission spectra are standard measurements in fluorescence spectroscopy. The figure demonstrates a measurement of a well documented standard test solution of anthracene in degassed cyclohexane. Sample: Anthracene in cyclohexane (10-5M). Measurement conditions: λex = 358 nm for emission scan, λem = 400 nm for corrected excitation scan, Δλex = Δλem = 0.4 nm, step size = 1 nm, integration time = 1 s.
In synchronous scans, both excitation and emission monochromators are scanned synchronously with a pre-set offset. The figure demonstrates a sample of five different aromatic hydrocarbons dissolved in cyclohexane, measured with a conventional emission scan (red) and a synchronous scan with zero offset (green). The five hydrocarbons are resolved by the synchronous scan. Sample: Five aromatic hydrocarbons dissolved in cyclohexane. Measurement conditions: λex = 280 nm for emission scan, Δλex = Δλem = 0.5 nm, step size = 0.5 nm, integration time = 1 s, offset = 0 nm. 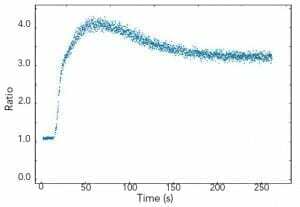 Kinetic scans reveal temporal changes of the sample fluorescence at fixed excitation and emission wavelengths. 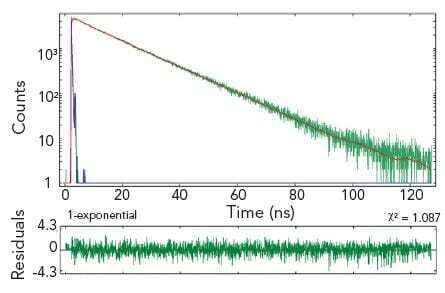 Luminescence emission in the milliseconds to seconds range, such as long phosphorescence, chemical reactions or chemical migration in cells, can be studied. 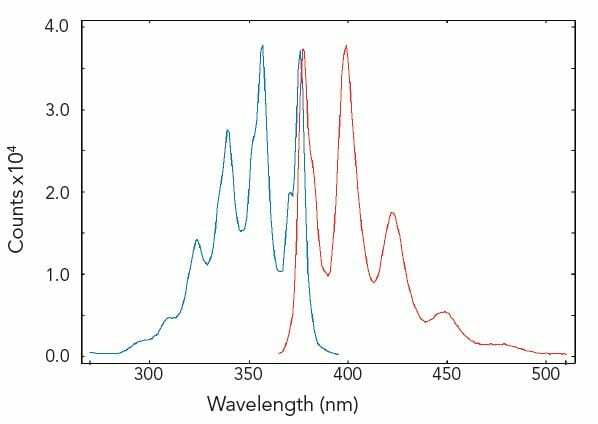 As an example, using the FLS980 in T-geometry for dual wavelength detection, simultaneous measurements of the Ca2+ active fluorophore Indo-1 can be made with both emission arms set to different wavelengths. Sample: Human platelets cells loaded with Indo-1 in 1 mM Ca2+. Measurement conditions: λex = 340 nm, λem1 = 485 nm, λem2 = 410 nm, Δλex = Δλem = 1 nm, integration time = 0.5 s.
The variety of measurement, display and analysis options allows easy and fast investigation of unknown luminescent samples or samples which contain different fluorophores. One method is to measure a series of emission scans within a selected range of excitation. The result is then demonstrated either in a 3D plot or in a contour plot. Sample: Three organic dyes in solution: naphtalene, anthracene perylene. Measurement conditions: Xe1, R928P, 280 nm ≤ λex ≤ 460 nm, 310 nm ≤ λem ≤ 620 nm, Δλex = Δλem = 2 nm, integration time = 0.5 s, repeats per scan = 1. The F980 software can communicate with Oxford Instruments Optistat DN (liquid nitrogen) and Optistat CF (liquid helium) cryostats (along with TE controlled sample holders). Temperature maps can be made by acquiring a series of emission, excitation or synchronous scans for a predefined temperature range. The individual measurements are automatically started when the target temperatures are reached. Sample: CuInSe2 (a material used for photovoltaic cells). Measurement conditions: F980 controlled Optistat, Xe1, NIR-PMT, λex = 694 nm, Δλex = 10 nm, Δλem = 5 nm, step size = 1 nm, integration time = 0.2 s. Temperature range: 6 K – 106 K, step 20 K.
The absolute method for fluorescence quantum yield measurements is becoming more widely used than the relative method, as it does not require a quantum yield standard. This is readily applicable to liquids, films and powders and can be extended into the near infrared spectral range. 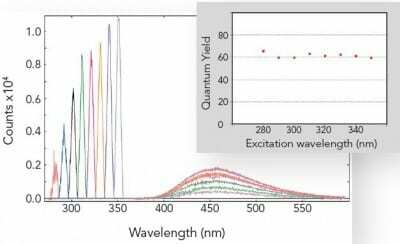 The picture shows the independence of the fluorescence quantum yield from the wavelength of excitation for a standard organic dye. The graph shows the area of absorption for eight different excitation wavelengths on the left, while on the right it shows the corresponding emission spectra, scaled by a factor of 5. The inset shows the calculated quantum yields. Sample: Quinine bisulphate in perchloric acid. Measurement conditions: integrating sphere, Δλex = 5.0 nm, Δλem = 0.5 nm, integration time = 0.3 s.
The emission of singlet oxygen is known to be very weak and, historically, powerful laser excitation has been used to monitor this. However, both excitation and emission spectra of singlet oxygen can be measured using the FLS980 with a broadband xenon lamp. The figure demonstrates a measurement of singlet oxygen luminescence generated from hematoporphyrin in ethanol. In a mixture of photosensitizers, the excitation spectrum may be used to identify the singlet oxygen generator. Sample: 10-5 M hematoporphyrin in ethanol. 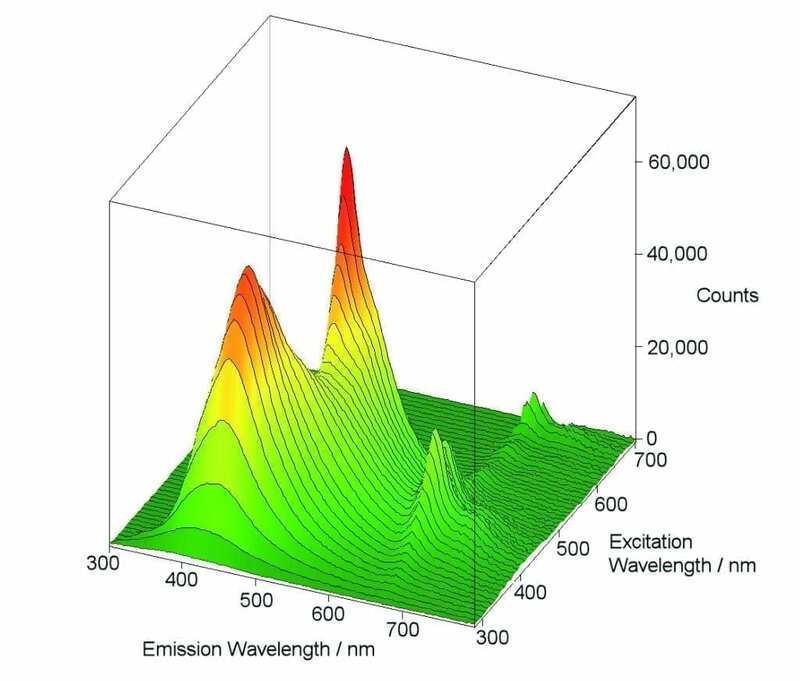 Measurement conditions: λex = 380 nm for emission scan, λem = 1270 nm for excitation scan, Δλex = Δλem = 2.0 nm, step size = 1.0 nm, integration time = 3.0 s.
Fluorescence upconversion materials absorb light in the near infrared spectral range and produce emission of shorter wavelengths in the visible spectral range. These upconversion materials are currently the focus of research for their use in dye sensitized solar cells (DSSC). Efficient upconversion is important for the efficiency of solar panels in the near infrared part of the sun’s spectrum. The picture below shows the upconversion emission of an erbium-ytterbium doped TiO2 powder, for four different levels of excitation power at 980 nm. As shown in the insert, some of the upconversion lines scale close to linear with excitation power, whereas others scale approximately to the square of the excitation power. Samples: Er3+/Yb3+ doped TiO2. 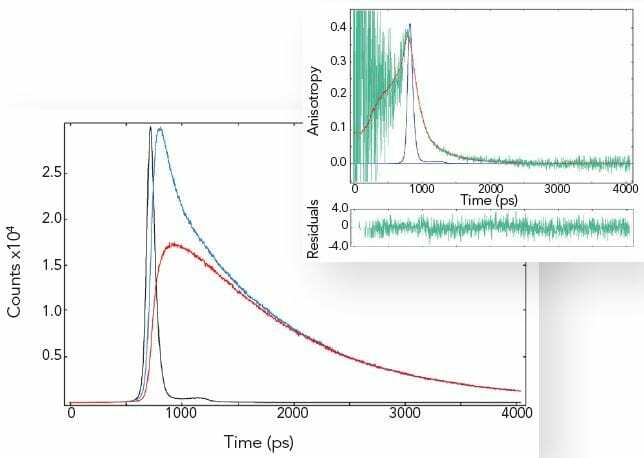 Measurement conditions: 1 W diode laser with power adjustment @ 980 nm, R928P, Δλem = 0.25 nm, integration time = 0.5 s.
Other steady state measurement examples: Steady state fluorescence anisotropy, contour plots, water quality assessments, excimer equilibrium, reflection, absorption and quantum yield measurements of phosphor powders, chromaticity and much more. 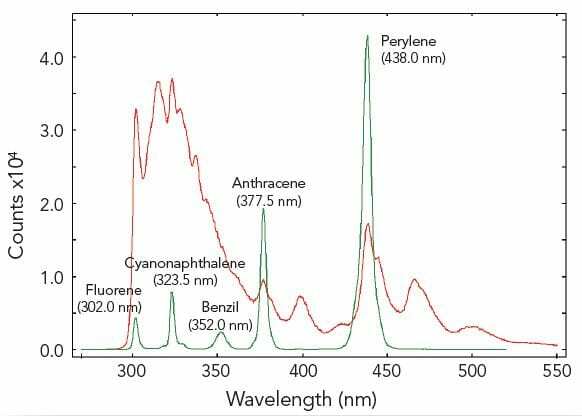 Fluorescence lifetime is an excellent parameter for analysing the interaction of fluorophores with their micro-environment, such as solvents, neighbouring fluorophores or non-fluorescing molecules. These “environmental” effects will reduce the natural decay process (characterised by the natural lifetime), to shorter and often more complex decay kinetics. 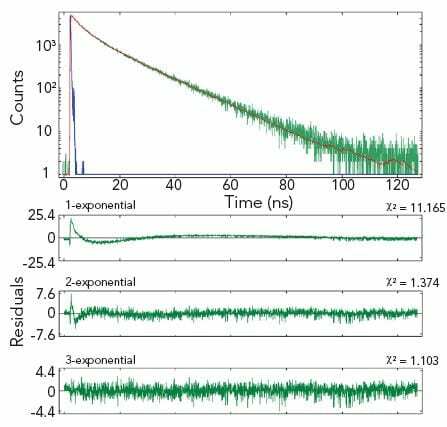 Most fluorescence decay kinetics are analysed by single or multiple exponential models. The user fits the raw data to a specific model. The quality of the fit will determine whether or not the selected model was appropriate, and – if it was – the result will provide the fit parameter such as lifetimes and pre-exponential factors. The example shows two measurement results of the same homogeneous solution, taken at two different emission wavelengths. The decay at the shorter wavelength is clearly a single exponential, the decay at the longer wavelength is best characterised by three exponential components. Data analysis: Multi-exponential reconvolution, confidence intervals verified by support plane analysis (FAST). τ1 = 15.02 ± 0.03 ns (left). τ2 = 14.80 ± 0.20 ns, τ2 = 4.62 ± 0.55 ns, τ3 = 0.81 ± 0.20 ns (right). 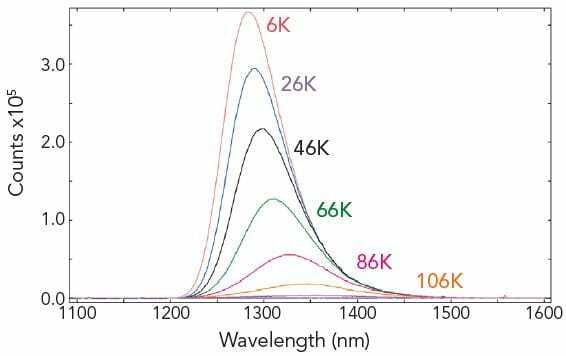 By exciting the sample with vertically polarised light and recording the emission in both the vertical and horizontal plane, one can calculate the fluorescence anisotropy of a homogeneous sample. The fluorescence anisotropy reveals the average rotational diffusion time of the molecules. 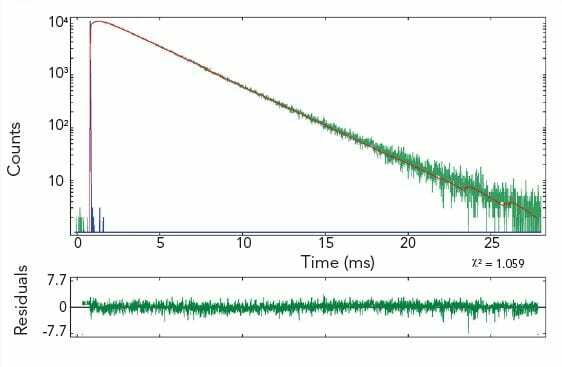 The measurement example shows that rotational diffusion in the picosecond time scale can be accurately measured. Most samples show rotational diffusion. To avoid this effect when precise fluorescence lifetime measurements are required, the emission polariser must be set to magic angle conditions (and vertically polarised excitation used). Sample: POPOP in cyclohexane (IRF, decays with parallel and crossed polariser – left plot), fluorescence anisotropy (raw data and fit – right plot). Measurement conditions: EPL 375, MCP-PMT, λex = 375 nm, Δλex = 2.0 nm, λem = 390 nm, Δλem = 2.0 nm. Data analysis: Full anisotropy reconvolution (FAST) with ellipsoidal rotor model. The rotation diffusion times are 110 ps, 150 ps and 620 ps respectively. A spherical rotor model results in a fit with significantly increased chi-square. POPOP is a rod like molecule. Other TCSPC measurement examples: Time-resolved emission spectroscopy (TRES), monomer-excimer kinetics, solvent relaxation dynamics and much more. The photoluminescence emission lifetime of lanthanides extends over a large time range from nanoseconds to seconds where the method of choice for time-resolved measurements is the MCS technique. Due to the high dynamic range and the accuracy resulting from counting statistics, complex decay analysis can be performed. 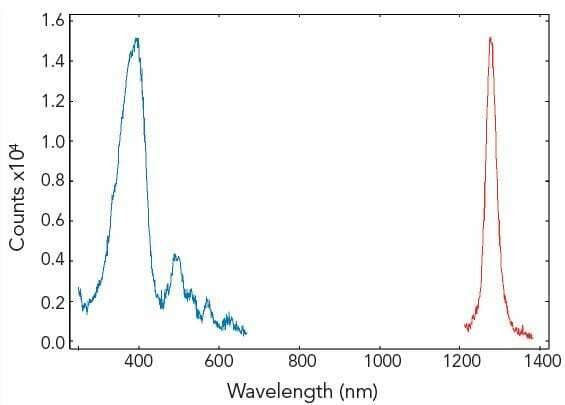 The pictures show time resolved measurements from a lanthanide doped glass sample at two different emission wavelengths. At the shorter wavelength the decay is best fitted with a three exponential terms, while at the longer emission wavelength the initial rise is followed by a millisecond decay. Measurement conditions: μF2, λex = 370 nm, Δλex = Δλem = 2.5 nm, rep rate 100 Hz, step size = 10 nm, spectra produced for every 50 μs (Top Left). μF2, λex = 370 nm, λem = 430 nm, Δλex = Δλem = 2.5 nm, rep rate 100 Hz, step size = 10 nm, measurement time = 2 min (Top Right). μF2, λex = 370 nm, λem = 612 nm, Δλex = Δλem = 1.7 nm, rep rate 20 Hz, measurement time = 8 min (Bottom Left). Data Analysis: Multi-exponential reconvoltution. Good fit results were achieved with four exponential decay model (Top Right) and model comprising two exponential rise and one decay function (Bottom Left). Other MCS measurement examples: Time-resolved singlet oxygen measurements, time-resolved FRET measurements and much more. Our systems can be equipped with double monochromators on excitation and emission arms. Double monochromators are recommended for highly scattering, low emissive samples as they improve the systems stray light suppression and increase the signal-to-noise ratio. A double monochromator in the emission arm allows for up to three detectors mounted simultaneously with software-based selection; two detectors can be fitted after the double monochromator and one after the first of the two monochromators. If further detectors are required, the system can be configured in a T-geometry (pictured above) by the addition of a seperate emission monochromator. This configuration can also be useful to provide a digital detection arm and an analogue detection arm. 450 W continuous wavelength lamps for steady state measurements. The excitation range is typically 230 nm to >1700 nm. Ozone generating lamps may be used to increase the lower range to 180 nm. μF1 and μF2: 5 W or 60 W pulsed xenon microsecond flashlamps producing short microsecond pulses for phosphorescence decay measurements. The excitation range is typically 230 nm to 1000 nm. nF980: ultrafast nanosecond flashlamp for time-resolved fluorescence studies with decays of 100 ps – 50 us. The excitation range is gas depedent. We manufacture a range of picosecond pulsed laser diodes (EPL Series) and pulsed LEDs (EPLED Series) for Time Correlated Single Photon Counting (TCSPC) measurements. Diodes are available over the UV-VIS spectrum starting at 250 nm and are pre-set with a range of repetition frequencies. The driver electronics are built into the light sources, eliminating the need for additional driver boxes and feature true “plug-and-play” usability. Various continuous wave lasers for use with the FLS920, FLS980 and FS5 are available. Some CW laser sources may also be pulsed by the spectrometer to allow, for example, upconversion decays with 808 nm and 980 nm excitation to be measured. The monochromators have triple grating turrets allowing up to three diffraction gratings to be permanently mounted within the monochromator. Standard gratings are generally chosen to cover the wavelength range of the detector. However, should you have more stringent requirements, such as requiring finer linear dispersion or an extended wavelength range, other diffraction gratings are available. We can offer diffraction gratings with a groove density of 150 g/mm up to >1800 g/mm which allows us to cover the range 200 nm – 8000 nm. Analogue detectors are used either for high light level applications with the requirement for high dynamic range, or as alternative detectors in spectral ranges where photomultipliers are unavailable or too expensive. Depending on the required application, the analogue detectors come in a variety of housings with a variety of cooling options. Analogue detectors find application either in the FLS or the LP spectrometers to extend the spectral coverage into the NIR to 5.5 µm. We offer detector assemblies that are supplied with PIN diodes with an active area of 3 mm. For steady state fluorescence applications the diode is mounted in a two stage TE cooled housing with collection/focusing optics chopper and lock-in. For time-resolved fluorescence or time-resolved phosphorescence applications, the diode is supplied in a two stage TE-cooled housing and with a digitising oscilloscope for data collection and averaging. The spectrometer’s software automatically downloads the data to allow automated measurements such as TRES and for further analysis and fitting. The TCC2 is an electronics module with USB interface, which incorporates all the electronic modules required for Time-Correlated Single Photon Counting (TCSPC) and Multi-Channel Scaling (MCS). This includes constant fraction discriminators, variable delays, time to amplitude converter and a large memory for multi-channel analysis. Magnetic Stirrer: Magnetic Stirrer to be fitted to single cuvette holder or 3-position sample turret. The stirrer comprises three stirrer bars and a stand-alone stirrer controller. EPR Dewar (77 K): Liquid nitrogen dewar (quartz) in mounting collar for FLS980 sample chamber with light tight seal, directly compatible to the sample chamber access flange. The dewar housing has a removable lid and built-in filter holders. Two individual EPR quartz sample rods supplied. Sample rod, containing the sample, will be immersed into the liquid nitrogen bath thus cooling the sample to 77K. Liquid Nitrogen Cryostat (77 K – 300 K): Oxford Instruments liquid nitrogen cryostat, OptistatDN. The assembly comprises the cryostat head, the temperature controller, and a mounting flange and pedestal, directly compatible to the FLS980 sample holder socket. Includes heater and sensor, cuvette holder, optical sample holder and sample rod. Spectrosil B quartz windows in L-geometry are used. Cryostat can be fully controlled by computer and F980 software. Liquid Helium Cryostat (3.4 K – 300 K): Oxford Instruments liquid helium cryostat, OptistatCF. The assembly comprises the cryostat head, the temperature controller, transfer tube and SV12 adaptor, VC31 gas flow controller, GF4 pump, and a mounting flange and pedestal that is directly compatible to the FLS980 holder socket. Includes heater and sensor, cuvette holder, optical sample holder and sample rod. Spectrosil B quartz windows in L-geometry are used. Cryostat can be fully controlled by computer and F980 software. Liquid Helium Cryostat Extended Temperature Range (3.4 K – 500 K): Oxford Instruments extended temperature range liquid helium cryostat, OptistatCF. The assembly comprises the cryostat head, the ITC503 temperature controller, the LLT600 transfer tube and SV12 adaptor, VC31 gas flow controller, GF4 pump, and a mounting flange and pedestal that is directly compatible to the FLS980 holder socket. All other inclusions as the standard liquid helium cryostat. Closed Cycle Cryostat Options: (4 K – 300 K, 10 K – 325 K, 6 K – 800 K): Includes helium compressor and hoses, sample exchange time is approximately 2 hours. 1st and 2nd stage cooling down to 10 K. Mounting flange and pedestal that is directly compatible to the FLS980 holder socket are included. The integrating sphere is a demountable accessory for the measurement of fluorescence quantum yields. It is 120 mm in diameter and has an inner surface coated with BenFlect to enable efficient scattering of light over a wide wavelength range. With the integrating sphere, the measurement of fluorescence quantum yields by an absolute method, as well as reflection measurements, are possible on solutions, film and powder samples. Holders for both direct and indirect excitation is provided. 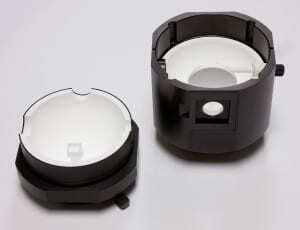 Two cuvettes and two powder trays are supplied as part of the sphere accessory. The Edinburgh Instruments microscope attachment, when supplied with an FLS spectrometer, enables you to record and measure wide-field fluorescence, as well as to measure a specific point on your sample. Its allows you to finely tune both the excitation light (illumination) and the detected emission, giving you the flexibility to fully tailor your experiment to your sample. The microscope can be supplied as either an upright and inverted microscopes. Imaging cameras are available spanning the spectrum from the visible to the near-infrared, up to 1700 nm. Excitation can be provided by halogen lamps (wide field excitation), picosecond pulsed diode lasers (EPL Series) and pulsed LEDs (EPLED Series), supercontinuum sources and Nd:YAG lasers (lasers and semiconductor sources provide point source illumination). 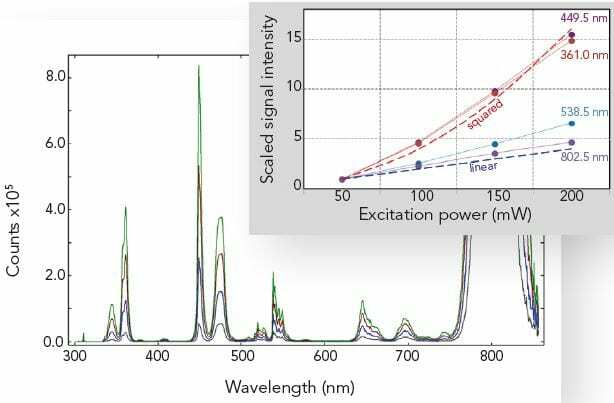 Steady state emission spectra and fluorescence lifetime measurements can be obtained from specific spots on your sample, when using appropriate lasers. Lasers can achieve a spot size of ~1 μm (objective dependent). The microscope control and data analysis are all carried out using a single software package. The spot measurements are intuitively displayed showing the automatic point-source “grid-like” measurement. Additional Options: XYZ Motorised stage with joystick, advanced software, warm plate with stage at 37°C, microstats for liquid N2/He temperature, up to six objectives, range of fibre bundles and liquid light guides, NIR transmission objectives, reflective objectives, NIR Imaging Cameras up to 1700 nm. The multiwell plate reader is an external module that is attached to the FLS920 to perform spectral or time-resolved measurements on multi-well plates. The multiwell plate reader module is coupled to the FLS920 by means of a bifurcated optical fibre. The control of the module is fully automated from the F980 software, temperature near the well plate is recorded. Spectral range depends on spectrometer configuration and bifurcated fibre assembly. 96 well and 384 wells are available. The titration accessory is based on a dual syringe Hamilton titrator (ML635) that is connected to the computer by RS232. The accessory comprise of two 1 ml syringes, connecting tubing, a flow cuvette and a light tight feed-through into the FLS920 sample chamber. Titration is controlled through the F980 software. Kinetic measurements with manual or automated titration steps and automated multiple spectral scanning are possible. Rapid kinetic accessory for multi-mixing capabilities. Comprises sample handling unit, fitted with three 1 ml drive syringes, 600 mm long umbilical, pneumatic drive system and square mixing/observation cuvette with standard dimensions (10 mm). Includes slotted sample chamber lid to allow the cuvette to be fitted to the spectrometer. Manual control.